Is proud to say that we are the only dealer anywhere in the world that has a data base for just about every coin Recovered from the World Trade Center certified as authentic by the professional coin grading service. We've recently learned that. Is not intentionally withholding population numbers from the World Trade Center Recovered Coin numismatic community, it is just that they really do not have the information due to some internal issues during that time period. They have the certification numbers on file, they just never separated the World Trade Center Coins during the certification process from the regular issues in their population report. 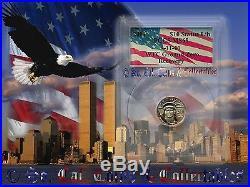 It is unfortunate that some World Trade Center Coins certified by. Holding a grade of MS69 were not properly recorded in their data base due to human error but hey, no one is perfect. On a regular basis to get the coins they missed into their population report but it was too time consuming for both sides and we did not want to be a thorn on their side. And just kept track of all certification numbers as we found them along with pictures of the coins that got missed. We know that these coins are legitimate and not Chinese counterfeits. Has to date cataloged and verified over. World Trade Center Coins and consider ourselves an authority in this category. It has cost us over half million dollars and hundreds of hours to attain this information that we can proudly say is 100% accurate. We started the World Trade Center Recovered coin data base with our computer program one month after their original release and know for a fact that some coins have traded hands 10 to 20 times over the years due to their increase in value and for a variety of other reasons. If you want to challenge us, send us the first four numbers of your certified World Trade Center Coin and we'll tell you the denomination and grade of your coin with a 5% margin of error but we do have your entire PCGS certification on file. The World Trade Center coins that we promote come with a. You will not get that guarantee from any other dealer anywhere in the world. World Trade Center Recovered coins as being certified by the Professional Coin Grading Service (PCGS). We are not including coins re-certified by the Independent Coin Graders or "ICG" This number is sure to increase as we broaden our research. It is hard to believe that some dealers today still misinform their customers about certain World Trade Center Coin population numbers in order to increase their profits. If you are purchasing a World Trade Center Coin from a reputable coin dealer, be sure to have them include the coins information on their invoice. Chances are they will not do that for you as their information is intentionally wrong. Up for your consideration is one of the most sought after. Of them were graded as. This information has been verified and we stand behind it 100%. The certification numbers for these four coins are. The coin that you are purchasing is coin number. The amount of Platinum Eagles recovered and certified were literally a drop in the bucket compared to the rest authenticated and certified by PCGS. This is a key coin to completing any WTC Collection and an awesome piece to add to your private collection. Not only will it add more historical value to your collection but it will help you get closer in completing one of every coin recovered if that is your goal. We now know with 100% certainty that there are only. According to the Professional Coin Grading Service. They did not keep records of how many of any particular WTC Recovered Coin was authenticated or can give the numismatic community any specific pop numbers because they do not know. We certainly hope that they will soon give out the true pop numbers for all of the WTC coins authenticated but we highly doubt it! World Trade Center Recovered coins as being certified by the Professional Coins Grading Service. This number is sure to increase as soon as we verify an additional. That we have just learned about today on 11-23-2017. Whether you get a WTC coin from us or any other reputable dealer, get one before they are all gone! We've raised the price for the coin on July 16, 2017 in hopes that is does not sell. Thank you very much for looking at So. On September 11, 2001 this great country of ours was the victim of a terrorist attack that forever changed the lives of millions of people worldwide. Three civilian airliners filled with innocent lives were hijacked and used as weapons to destroy the World Trade Center and a section of the US Pentagon, center of all military operations. A fourth airliner, United flight 93 crashed in a rural part of Pennsylvania thanks to the heroism of a few good Samaritans aboard the airplane according to reports given by the media. Because of the total devastation at ground zero, there was virtually nothing left to salvage. The few items that were salvaged became part of the memorial dedication at the site of the former Twin Towers. Inside tower 1 of the World Trade Center, the Commodities Futures Trading Commission held what was known to the investment world as the COMEX vaults. Inside this network of vaults was a vast collection of investment grade Silver, Gold and Platinum held by a variety of financial institutions from around the globe. When the Twin Towers fell, no one expected to find anything salvageable. As the cleanup effort continued, on November 1, 2001 the workers at ground zero reached the Iron Mountain vault located directly under the World Trade Center. Inside were Silver, Gold and Platinum bullion as well as coins from around the world that miraculously survived the disaster. The coins recovered were from various countries around the world, here is the list. Under high security, the coins were loaded into Brinks Armored vehicles and sent directly to Collectors Universe, the parent company of the world renowned. They were then cataloged, graded and encapsulated in the patented. High security tamper resistant capsules along with a specially designed commemorative United States Flag insert that immediately identifies the coin as a genuine artifact recovered from Ground Zero at the World Trade Center. These magnificent pieces of our American History will forever remind us of our brothers and sisters in New York as well as the great sacrifices our military personnel have gone through bringing to justice those responsible. It is my solemn belief that holding a piece of History in your hands can bring into perspective the necessity of the sacrifices of our US Armed Forces. This is one Historical piece that can never be duplicated and will serve as a reminder of our Fallen Heroes and fellow Americans that were needlessly killed on September 11, 2001. Thomas Jefferson wrote a letter to friend saying. The tree of liberty must be refreshed from time to time with the blood of patriots and tyrants. It is with Great Honor, Pride and Respect that I find myself able to take this opportunity to personally give thanks to all of my fellow service men and women of our Armed Forces for their sacrifice and service to this country. The coin in the picture is the one you will get. Will be free fully insured with. Item to be paid within three days of auctions closing. Please take into consideration that. "We are not a professional coin graders" If you disagree with the grade on the holder, you can take that up with the grading service and not So. Our goal is to get you what you paid for and not have it cost you a penny more. SOME VERY IMPORTANT FACTORS THAT SHOULD BE CONSIDERED BEFORE INVESTING IN THE RARE COIN MARKET. Is highly speculative and involves a substantial risk. As in other markets, coin prices can be extremely volatile. Prices will rise and fall depending upon market conditions. Therefore, before purchasing coins, you should first have adequate cash reserves and other assets to absorb a potentially significant loss. The rate of appreciation in numismatics always depends on the demand for the coin, availability, current market conditions and the coins rarity. It may be necessary to hold coins for a 2 - 5 year period and maybe even 10 years in order to have any chance of realizing its maximum potential gain. Otherwise you will be in direct violation of United States. Violators will be dealt with accordingly and prosecuted to the fullest extent of the law. The item "WTC 2001 PCGS MS68 $10 Dollar Recovery Platinum Lady Liberty Pop 4" is in sale since Friday, September 9, 2016. This item is in the category "Coins & Paper Money\Bullion\Platinum\Coins". The seller is "imhoteppyramids" and is located in Escondido, California. This item can be shipped worldwide.